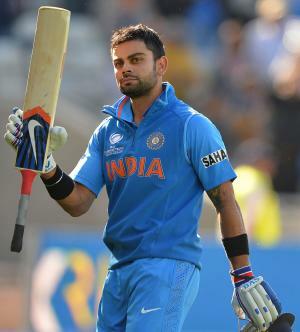 Virat Kohli was born on the 5th November 1988 in Delhi, India, and is an Indian cricket player, a batsman and right-arm medium pace bowler of the Indian Team, and is a member of the cricket team Royal Challengers Bangalore in the Indian Premier League. His career has been active since 2006. Have you ever wondered how rich Virat Kohli is? According to sources, it is estimated, that Virat Kohli`s overall net worth is $15 million, an amount mostly garnered through his career as a cricket player, however, adding to his net worth, in 2014, Virat has started his own youth fashion brand “WROGN”, and moreover, he is a co-owner of the Indian Super League soccer club FC Goa, and he is a co-owner of the International Premier Tennis League franchise UAE Royals. Virat is the youngest of three siblings; he grew up in Uttam Nagar in a Punjabi family. Regarding his education, Virat attended the Vishal Bharti Public school, but later dedicated his life to cricket. When he was just three years old he would take the cricket bat and play with his father (who died in 2006). His love for cricket grew, and he became a part the West Delhi Cricket Academy when it was formed in 1998. Virat`s net worth has been on a constant rise since 2006, when he became a part of the Delhi cricket team. Virat first entered the field in November against the Tamil Nadu cricket team and had a score of 10, however, his big game happened in December, against Karnataka, when he scored 90, only a day after his father`s death. Ever since the debut, Virat has made a name for himself, setting numerous records in cricket; some of them include the fastest century in ODIs by an Indian batsman, fastest Indian cricketer to reach 1,000 runs in ODIs, most ODI runs in 2011 by any cricketer, most ODI runs in 2014 by an Indian cricketer, and many others that have increased his popularity and also his net worth. Other than his successful club career, Virat can also pride himself for his involvement in the National Indian team, winning the 2011 World Cup; furthermore, he has received over 20 Man Of The Match awards in the ODI formats. He is currently the captain of the Indian Team that competes in the Test cricket , and vice-captain in the limited overs versions of the game. Over the course of his career, Virat has many accomplishments to his name, apart from captain of the Indian Team. He has captained the Royal Challengers Bangalore, and received the ICC ODI Player Of The Year award in 2012; furthermore he received the Arjuna Award in 2013. Virat`s overall net worth has also benefited from his endorsement deals, as he currently has 11 brands as sponsorships, some of them including PepsiCo, Adidas, Boost, Munch and TVS Motors among others. Virat`s name is also popular off the field because of his charity work; in 2013 he established the Virat Kohli Foundation, which aims at helping the kids growing up in inhuman conditions. In 2014, eBay and Save The Children India alongside the Virat Kohli Foundation organized a charity event and the funds they accumulated were generated towards the education and healthcare of underprivileged children. Regarding his personal life, Virat is in a relationship with Bollywood actress Anushka Sharma. PSL 2019: Why do Virat Kohli and MS Dhoni not play in Pakistan Super League?